VANCOUVER – April 10th, 2017 – Back in January, we wrote about how board-run George Bell Arena in Toronto, Ontario is using REALice-treated water sourced straight from the cold water tap to resurface their ice. Over the past two months, both supplying utilities, Enbridge Gas and Toronto Hydro, have kept a close eye on this year-round, single pad’s natural gas and hydro consumption to get an idea of REALice’s impact. Despite an unusually warm winter, George Bell’s consumption has plummeted. Enbridge Gas has estimated a reduction of 872m3 per month. Over the course of a year’s operations, those savings will amount to over 10,000m3 — or a cost avoidance of over $3,000.00. That what’s being saved just by no longer heating up their resurfacing water. Less obvious, but with a tremendous impact on the facility’s annual energy spend, are the arena’s electricity savings. Because the REALice-treated cold water contains less micro air bubbles once it hits the ice surface, it freezes faster. This let the George Bell Arena go to a higher set-point temperature, resulting in a significant reduction in their compressors’ run time. This has a direct impact on hydro consumption, which Toronto Hydro has verified to be an annual reduction in Hydro usage of 73,512 kWh for this facility. 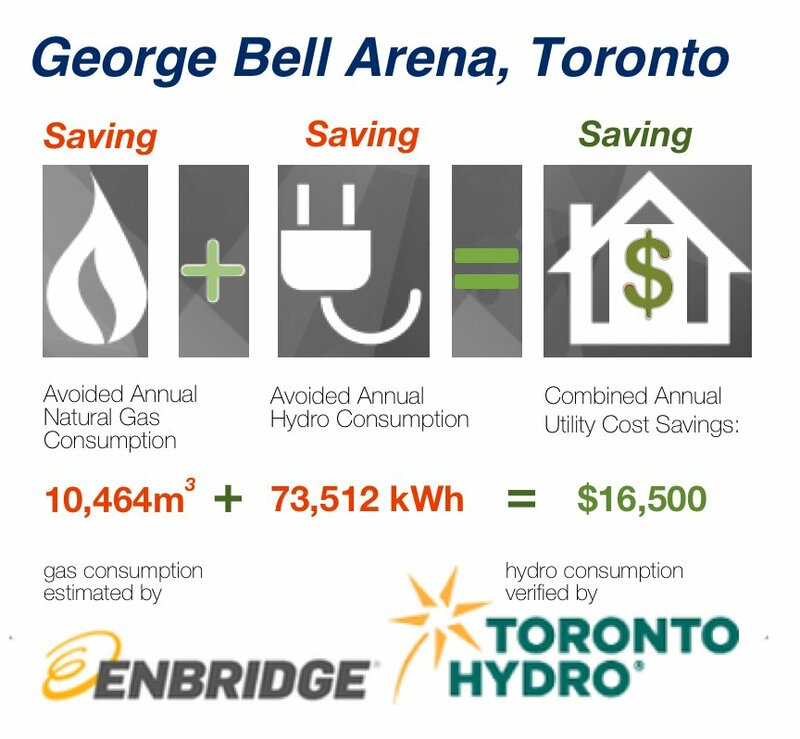 In addition to an energy efficiency incentive of 10¢/kWh that the George Bell Arena will receive from Toronto Hydro, that reduction in Hydro consumption will save George Bell over $13,000 this year in avoided Hydro costs at today’s current rates. That in itself is tremendous, but their lower run time means additional savings with less compressor maintenance in the long term, extending the shelf life of their equipment. What about the Ice Quality? Can I get utility incentives for REALice too? Yes! In Ontario, Enbridge Gas has extended their cold water resurfacing incentive program until the end of June, 2017, offering a $5,000 rebate per ice pad. Union Gas offers incentives too – and Hydro incentives are available through Ontario’s Save On Energy program. Ontario’s Hydro companies may pay as much as 10¢/kWh in addition to load incentives for arenas running year round. Incentives, rebates and grants may be available in other provinces too. Contact us for more details.